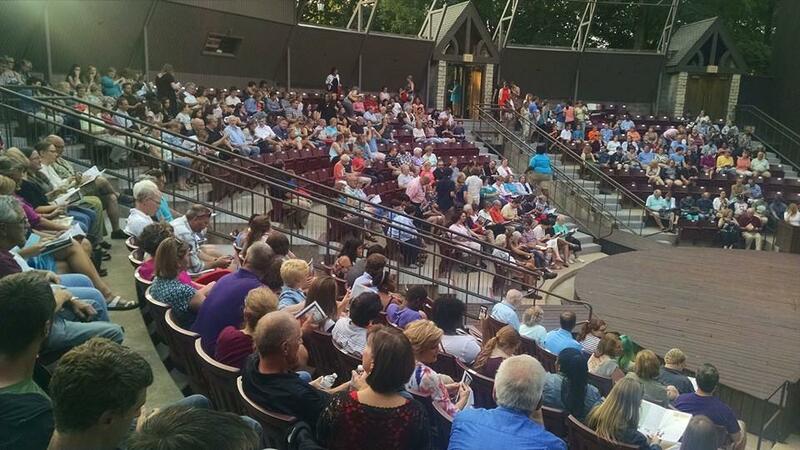 The audience at the Illinois Shakespeare Festival plays an important role in each play. The 2016 Illinois Shakespeare Festival is just getting underway, and for one stalwart performer, this season marks an even dozen times he's trod the boards at the theater at Ewing. 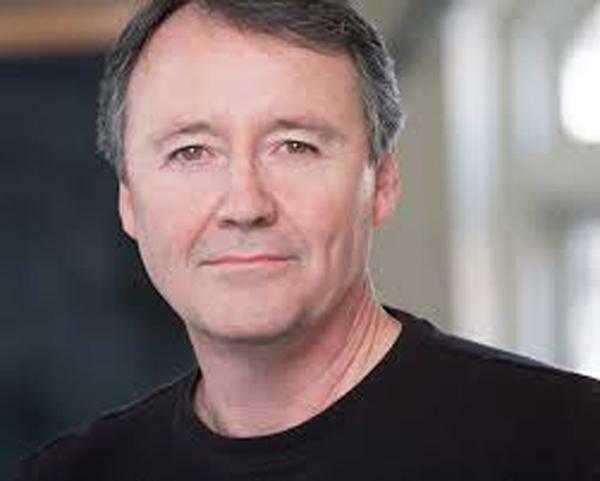 Actor Tom Quinn has portrayed a wide variety of characters, from a king to a musketeer. 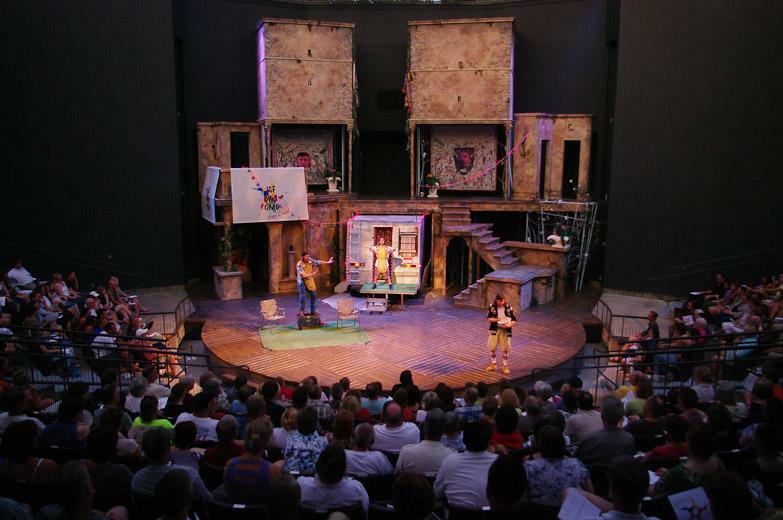 So in honor of his twelfth season, which includes a turn as Feste in "Twelfth Night," Tom has pulled back the curtain to share twelve secrets of the Illinois Shakespeare Festival. Esprit de Corps - There's a great feeling of camaraderie that runs through each season of the ISF. Ice Packs Are Important - The Festival runs from July into August, so naturally the actor's costumes can get very hot, said Tom Quinn. So the clever costume designers will try to incorporate pockets into which the actors can tuck ice packs in order to stay cool on stage. Gravity: It's The Law - The Theater at Ewing has a two-tiered stage, called the above, that's about twelve feet above the stage. So far as it's known, Tom is the only person to fall from the above. It was during the rehearsals of "The Three Musketeers" and a mishap had Tom plummeting to the stage below. Fortunately, he landed like a cat on all fours and only bruised his feet a bit. Spirit Gum - It's a necessity in the theater because it helps keep on beards and mustaches. Quinn hates it. "It's sticky," he said. "And doesn't always work in humid conditions." So the actors must contrive to keep their facial hair in place, even if it slips during a performance. June Bugs - In an outdoor theater, nature must be dealt with. And if you've got a big June bug crawling across your face during a tense scene in "King Lear," you've just got to put up with it. Brushing it away or flinching is a distraction, and actors endure this indignity for the sake of the play. Memorization - "The older you get, the harder it gets to memorize lines," Tom Quinn said with a laugh. So he starts soon after being cast in the winter, but doesn't completely memorize the lines. He wants the last part of that process to be in collaboration with the people he's on stage with. Forgetting A Line - It happens. No matter how well you prepare. But there's a little iambic pentameter SOS for the actor who blanks on the next line. It's "In sooth, my lord, I know not what to say." Blurt that, and your fellow actors will know your distress and come to your rescue. Live Music - For many years, the ISF used pre-recorded music for their shows. Now, under the auspices of Artists Director Kevin Rich, the show adheres to original practices, that is, it follows what Shakespeare did in his day. And that includes having live music from live musicians during the performance. Airplanes Happen, And Actors Have To Deal With Them - The theater at Ewing is on a flight path for the Central Illinois Regional Airport, so sometimes several times during a show the actors have to contend with the noise of airplanes flying overhead. It takes concentration. The Audience Plays An Important Role In Every Show - "The audience is a real character in the play, " explained Quinn. There is an interplay between the audience and the actors that Quinn describes as mutually energizing. The End Of The Season Has A Note Of Sadness - You've worked hard for several months with a group of people, and now it's over. There's some melancholy in that, but Quinn said there's always the possibility of working together again someday. Tom Quinn's Twelve Seasons at the ISF Is Not The Record - That goes to his friend, Dave Kortemeier, who has appeared thirteen times.